The Northwest Territories is closer than you think. 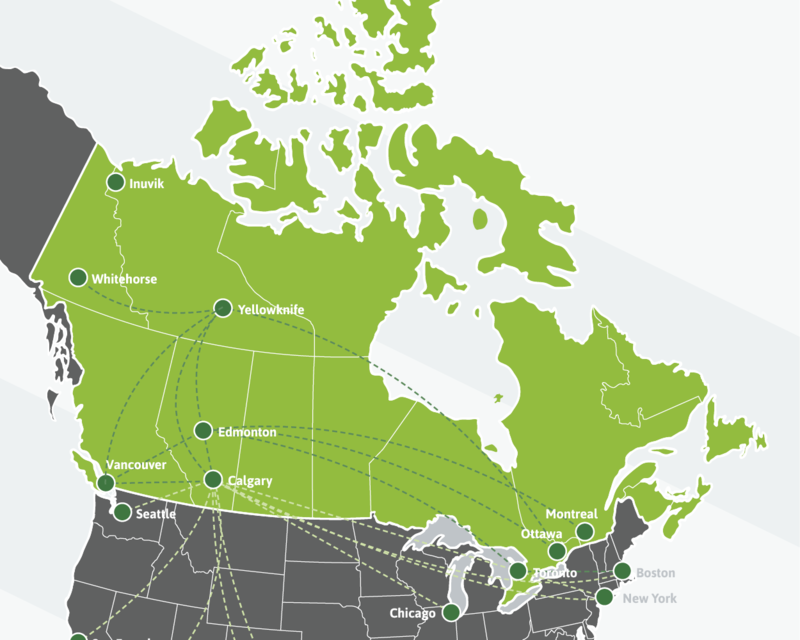 Daily jet service operates from Calgary, Edmonton will take you to Yellowknife in under two hours. Direct flights from Ottawa and soon to be Vancouver will get you here in no time. Take the scenic route and go on a road trip up to and around the territory. Vehicle and RV rentals are available in major centres. Our scenic highways offer wilderness, campgrounds, picnic spots, roadside attractions and vehicle services. The communities, parks, lodges and historic sites of the Northwest Territories are easier to get to than you think. All major communities in the territory and many of the smaller outposts are linked by year-round highways. Most routes are paved, and you can drive on them with a standard car. Winter, connects all our remote settlements to the outside for a few months by ice road. Built on top of packed snow and metre-thick lake ice, driving on the frozen road network is a bucket list item for many. Ice roads weave through the Mackenzie Delta, the Mackenzie Valley, the North Slave region, and to the Dehcho towns of Nahanni Butte and Sambaa K'e. Scheduled flights go into almost every community in the Northwest Territories. Inuvik is the main hub for flights to smaller communities in the Western Arctic. Norman Wells services the Sahtu region, and flights out of Yellowknife serve the southern half of the territory. Planes are well-equipped to land on our diverse terrain. Floatplanes are the most common, but they're occasionally fitted with big tires for landing on sand and skis in the winter. Charter a flight for travel to national parks, wild rivers, remote fishing lodges and other isolated places.